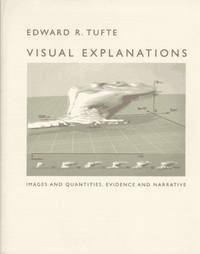 Visual Explanations: Images and Quantities, Evidence and Narrative (SIGNED). Cheshire, CT: Graphics Press, 1997. Fourth Printing with Revisions Cloth AS NEW in AS NEW DJ 4to (9 x 10-3/4), 157 pp including Index. Publisher's materials and printout of a review included. Book is UNREAD and AS NEW in AS NEW DJ -- no marks, tears, crimps, folds (now protected in Bro-Dart cover). SIGNED by the author in red ink on the title page. Mr. Tufte continues and expands his tutorial on graphic communication.